Ramen is a well-known dish that originates from Japan. Its main ingredients are Chinese noodles (made from wheat) and meat broth. Sometimes, the broth can be fish-based and some extra flavoring is added using soy sauce. Ramen is bought in the form of a package and can be acquired at any supermarket or grocery store. Inside the package, you find the main ingredients mentioned above. This product is cheap to buy and the time to cook it doesn’t take more than a few minutes. You just have to add hot water and a few spices. 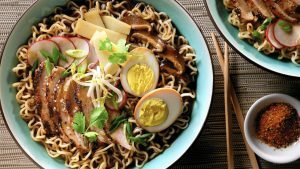 These reasons make ramen a dish preferred by people who don’t have a lot of time to cook, or who live a fast lifestyle. It is extremely popular among college students, especially. In its simplicity, ramen remains an extremely versatile dish. Using some imagination, anyone can transform a ramen meal and improve it in order to become more authentic and delicious. Here are a few tips on how to achieve that. 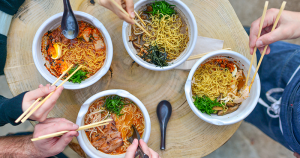 One of the simplest ways to upgrade the tasting quality of a ramen dish is to add ingredients that require no additional cooking. You can buy or search in your pantry cabinet for simple sauces or condiments such as chili bean sauce, Miso paste, fish sauce, Harissa, Thai curry paste, Japanese curry powder or vinegar. However, you do not want to add too much or too many different flavors, as they will not complement each other in a good way. Try to keep the dish simple and elegant. If one of the seasonings that you add to ramen is salty, take into consideration that you might want to omit adding the seasoning packets that often come with the bought ramen. The dish will end up being way too salty. Another type of ingredient that requires no cooking are spices. You can add white pepper, chili flakes or Sichuan pepper. You could add star anise, a cinnamon stick or coriander seeds to the broth while it’s simmering; just remember to take them out before serving the dish. Fats are a good option to add to the ramen as well. You have animal fats from chicken, duck or pork and also chili oil or sesame oil. You could also use citrus juices; a squeeze of lime or classical lemon before serving the dish can make a significant difference in the flavor. Ramen consists mostly of fat and starch, thus lacking protein. Therefore, in order to bring some nutritional balance into this dish, you could simply use some eggs as an extra ingredient. Eggs are not expensive and most of the times you don’t need a separate pot to cook them. You use the same one in which the broth and the noodles are cooking. Eggs can be cooked in a different number of ways, all of which could fit a ramen dish. To add hard-boiled eggs to your meal, put the eggs into a pot with cold water, turn the temperature high and wait until it boils. When this happens, just add the noodles. By the time the ramen is cooked, the eggs will be hard-boiled. Soft boiled eggs need more attention because you have to watch the clock during the process. You have to drop the eggs into already boiling water and take them out after 3 minutes if you want them to be extremely soft, or after 5 minutes if you want them to have a solid egg-white and a fluid yolk. The egg-drop method will result in small egg blossoms that coat the ramen noodles. You firstly need to beat an egg in a separate bowl. After the noodles are cooked, swirl them around together with the broth while slowly pouring the beaten egg over them. Fine ribbons of the beaten egg will float in your dish and coat the ramen. To include poached eggs to the dish you have to cook the noodles only halfway. You can tell when this is done, when the noodles will start to separate. At that moment turn off the heat and break an egg in the middle of the noodles. Put the lid back on the pot and just wait. Due to the residual heat, both the egg and the ramen noodles will finish cooking in a couple of minutes. Fried eggs are simple to make and the only challenge is that they require a pan and an auxiliary heat source. Just crack the eggs into the pan and wait for them to fry. When they are done, add them to the cooked noodles. Pieces of meat that are thinly sliced can easily be cooked straight into the pot. There are a lot of options from which you can choose starting with chicken breast or pork tenderloin and ending up with flank steak. Just stir the meat together with the noodles in the broth. Take the pieces of cooked meat out, set them aside and add them back on top before the ramen is served. Bacon or ham are good candidates as well. If you have leftover meats in your fridge such as steak, chicken or hot dogs you can use those as well. Shredded beef jerky added to the cooking broth gives the dish a pleasantly chewy texture and a smoky saltiness. Some people prefer vegetables and like their dish to contain more green ingredients. If you want to stay away from animal proteins, you can add to your ramen ingredients like broccoli, carrots or peas. You have to add them about three minutes before the ramen is done cooking. You will add more nutrients and your meal will become a lot healthier. If you want some crunch in your ramen, use bok choy or green onion. These traditional flavors will certainly improve your dish. If you want to try a different ramen cooking method, you can stir-fry your ramen or try some dishes with cold noodles. The secret is to turn the heat off before the ramen is done. The dish will still continue to become softer, due to residual heat. As is generally the case with stir-fried dishes, you must have the pan hot enough prior to adding the necessary ingredients. This way, you will obtain that wanted sear, without anything overcooking. The meat and the vegetables should be cooked into a skillet that contains some oil before you add noodles and sauce.